There is an interesting old house upon a hill. The visitor is likely to be whisked to it by automobile but a better way to approach it may be on foot, the time for the ascent offering space for the mind to ascend from the mundane. Arriving at the house brings a commanding view of pastoral lands but the house has a brooding spirit. Its flinty rocks and mute windows yield not a hint of the furious passions here more than a century and a half ago a mob of men and women stirred up by desires for religious and economic freedom, a widow anxiety stricken for her innocent children, and police fearing the blood-lust of the kin of those they killed. This is the War House near the village of The Commons in the Slieveardagh Hills in County Tipperary. Here on 29th of July in 1848 the disciplined forces of the state met high-minded patriots ready to take the ultimate risk for Irish freedom. The events of that Saturday are historic; and also salutary for today, when secularist states make freedom vulnerable to the kind of absolutism that ruled in 1848. There are, of course, those who denied any grandeur to the events. In truth, there was plenty of bathos in a national insurrection carried out in what was derisively termed “Widow McCormack’s cabbage patch.” An element of humor can be wrung from unwary villagers being shot: the police taking the widow’s little children hostage, and a great leader making-off on a policeman’s horse. On the other hand that Saturday can be seen as the tiny seed ‘that must die’ to produce the flower of freedom. The turn of events at the War House was providential to the founding of The Fenian Brotherhood and its contribution to Irish freedom. Michael Doheny was part of a war council in The Commons on Friday and a close confidant of James Stephens, a central figure in Saturday’s events at the War House. He was also a founder of Young Ireland; the political, cultural, and social movement that redefined the nationalism of Daniel O’Connell. Although at later times in New York he may be justly called impetuous, in regard to the 1848 rebellion Doheny was pragmatic and courageous. He was aware of the appalling lack of food, he knew of a lack of military acumen in the leaders, and of the shortage of armaments and training to be arrayed against the professional forces of the state. Yet in a battle that he did not start and saw little hope of winning, he was ready to risk his life for freedom. When defeat came he made a daring escape worthy of the mythical Fenians. Here he records these adventures in poetry and prose, giving a generous assessment of friend and foe alike. Beyond the tale of high adventure here the reader will seek out the metaphysical principles that must lie at root of a fight for culture and nation. Doheny’s primary allegiance, was not to a king, but to a mysterious feminine being the mythological Ireland or Eire. Here were primeval emotions shrouded in the sacredness of the tribe and of warriors who sacrifice their existence for the existence of the group. But Doheny the dreamer was a thoroughly practical man and fought for the Western ideal of freedom born of the clash of Christianity with the Roman Empire. The great strength of Rome lay in economics. It created the stability needed for agriculture, trade and learning and was a bulwark against reoccurring famine, and enslavement by foreigners. But as an absolutist state it opposed the Christian insistence on freedom of conscience. In the fifth century Patrick brought with him to Ireland that ideal of separate spiritual and civic powers on which freedom rests. History shows the problems in Ireland were pan-European. While Young Irelanders were rousing nationalist sentiment Giuseppe Mazzini and La Giovine Italia movement created modern Italy. Of course, freedom and equality are the antipodes of democracy, and while England’s oppression united Irish Protestants and Catholics in a quest for freedom it was later to be trumped by egalitarianism. Additionally the transcendent aspects of human freedom in Mazzini’s slogan “God and the people” was to give way to a secular ideal. 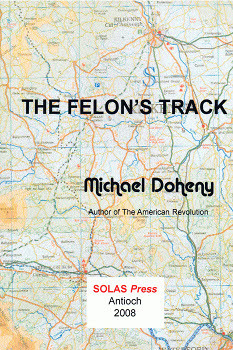 In this important book, Doheny provides a unique view of events. Through his democratic ideals and his defense of conscience he illuminates the liberalizing developments. He provides a window on the philosophy that energized the protracted cultural and political struggles of nineteenth century Ireland.